Junk Raft: An Ocean Voyage and a Rising Tide of Activism to Fight Plastic Pollution tells the terrifying and important story of plastics in our oceans, framed by Marcus Eriksen’s journey aboard Junk, the all-plastic raft he and his sailing partner took from California to Hawaii to raise awareness of the plight of our seas. 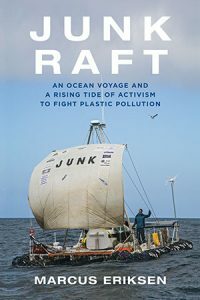 Eriksen, who would later go on to co-found the organization 5 Gyres Institute with his wife, Anna, writes about the 2,600-mile journey over eighty-eight days and its challenges—among them, structural problems with the raft and bracing storms—interspersing the narrative with facts that all consumers should know about plastic and its effects on the environment, especially the oceans. For example, even if we are among those who recycle, it’s not enough: up to 12 million tons of plastics end up in the ocean. Junk Raft details the history and contemporary problem of plastics, including their production, the powerful lobbying that keeps such items as plastic bags in the marketplace, and the devastating effect plastic has on marine life. Countries like Germany and Chile are on the forefront of recycling that works—from reducing packaging to requiring producers to recover the waste from their own products—and by contrast, Eriksen writes, the U.S. is the only country of the thirty-five members of the Organisation for Economic Co-Operation and Development that does not have extended producer responsibility for packaging. Only ten U.S. states have bottle-recycling programs. When it comes to plastics, marine animals are the biggest losers of all. Various studies have estimated that between 9 and 35 percent of fish have plastics in their stomachs—and this doesn’t even include sea lions and seabirds, and all those animals caught in discarded fishing gear. If today’s plastic waste goes unabated, up to 99 percent of seabirds will have ingested plastic by 2050. 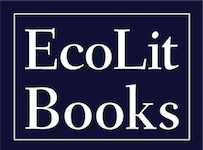 “Even in fish markets,” Eriksen writes, “clams and fish have been found with abundant micro- and nanoplastics in their guts, which we ingest if we eat them whole.” One recent study in the U.S. and Indonesia found that 25 percent of the fish in markets had plastics in their stomachs.